Just as MediaWorks swapped episodes of The Simpsons back and forth between TV3 and Four, so will TVNZ alternate seasons of Family Guy. Episodes from seasons 9-13 air six nights a week in SD on Duke but season 14 will premiere on TV2 on June 24 as part of a new-look Friday line-up that includes the latest dating show twist, Strip Date. Double episodes of Family Guy will air 9.30 Fridays opposite TV3’s Live at the Apollo, so should be well and truly bedded in to challenge 7 Days when it returns. They will follow the Channel 5 series, Strip Date, which is being double-billed with the latest season of The Voice Australia. As provocative as it sounds, Strip Date is not the UK adaptation of Italy’s much racier Undressed but essentially a fashion makeover. The publicity blurb describes it as “the blind dating show where two singletons get made over to look like each other’s dream date. Meanwhile, the resurgence of dating shows in primetime continues, with TV2 succeeding First Dates Australia, which has been a Monday night hit, with First Dates UK from June 20. Why put on dating shows with rudeness? They will lose good viewership? What about another entertaining new drama? 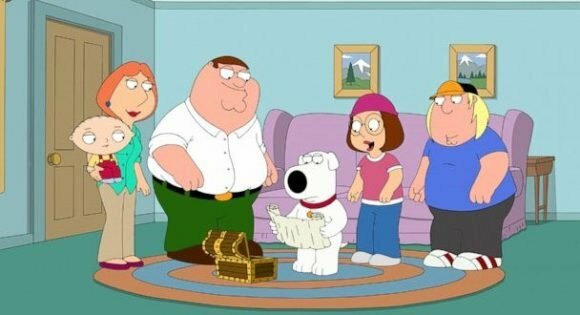 Hey Phil, finally TV2 decides to play new episodes of Family Guy, it’s also been good to watch them on Duke everynight at 8pm, so now it’s still a waiting game to see when will TV2 air classic Simpsons along with there new episodes they play on Sunday nights! I do think it’s quite poor of TV2 with the way they handle this situation of The Simpsons. I mean TV3 and Four played dozens of episodes for when they had rights to the show. I noticed the box changed their Simpsons timeslot from 5 to 6pm. I wonder what there decision was behind that, but I don’t think this would affect TV2’s viewership if The Simpsons played at 6pm or 5pm because not everyone has Sky TV. I guess the question is to ask here is… Have you heard anything else from TV2 to when or what time classic Simpsons will finally air …?